FRAMINGHAM, Mass., November 28, 2017 – According to the latest forecast from International Data Corporation (IDC), global shipments of personal computing devices (PCDs) – composed of traditional PCs (desktop, notebooks and workstations) and tablets (slate, detachable) – are expected to decline 2.7% year over year in 2017. While this is a slower contraction compared to the previous year, IDC's Quarterly Personal Computing Device Tracker forecasts the shipments to decline further (4% year over year) in 2018. Looking toward the end of the five-year forecast, volumes are expected to continue declining from 423.3 million in 2017 to 393.9 million in 2021. This represents a five-year compound annual growth rate (CAGR) of -2.0%. When breaking down the PCD market, traditional PC shipments are expected to drop from 260.2 million units in 2016 to 248.1 million in 2021 units, resulting in a five-year CAGR of -0.9%. However, when detachable tablets such as the Microsoft Surface Pro are added in, the five-year CAGR improves to +0.3%. Out of the five major product categories in the PCD market, desktops and slates will continue to decline over the duration of the forecast, while detachable tablets, workstations, and notebook PCs will show signs of volume improvement. Although the 0.3% CAGR is positive news, examining the market along geographic lines shows the PCD market will continue to face challenges in growing both volume as well as margins. With over 69% of shipments in emerging markets going toward traditional notebooks and slate tablets in 2021, price points remain very sensitive in countries once pegged as ripe for growth. Conversely, while convertibles and ultraslim notebooks have found increased favor in developed markets, China will be the only developing market among the top 10 markets for these devices in 2021. "Detachable tablets are expected to see double-digit growth from 2018 through 2021," said Ryan Reith, program vice president with IDC's Quarterly Mobile Device Trackers. "Windows-based detachables already count for close to 50% of the volume in this category and this isn't expected to change much over the duration of the forecast. Apple's iPad Pro lineup will remain at 30-35% of the category with the remainder going to Google-based devices. It is clear this is a category that has the interest and now investments from both PC and smartphone OEMs, but when looking at the overall PCD market it accounts for just 5% of volume in 2017, growing to 9.4% in 2021." 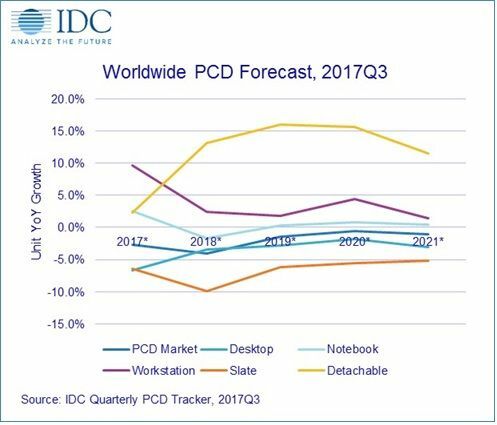 "For much of 2017, the traditional PC market outperformed expectations despite a shortage of key notebook components as well as pricing pressures," said Jay Chou, research manager with IDC's Quarterly Personal Computing Device Tracker. "IDC believes the shortage issues should ease as we head toward 2018. Despite shrinking demand overall, IDC remain optimistic the market can expect continued growth in emerging form factors such as convertibles and ultraslim notebooks, which when combined will form the dominant notebook form factor by 2019." IDC's Worldwide Quarterly P ersonal C omputing Device Tracker gathers data in more than 90 countries and provides detailed, timely, and accurate information on the global personal computing device market. This includes data and insight into global trends around desktops, notebooks, detachable tablets, slate tablets, and workstations. In addition to insightful analysis, the program delivers quarterly market share data and a five-year forecast by country. The research includes historical and forecast trend analysis.